« Architecture by bike: best way to get to know your neighborhoods and bring a new crew of locals into the architectural fold! Anyone who has worked in preservation eventually gets a little bit tired of seeing the insides of old, restored Victorians (admit it), and good lord, once you’ve seen a dozen green buildings, you’re pretty much over the typically installed measures and upgrades. But occasionally, I still get to be surprised–the tour I went on today was astonishing, and showed how preservation and efficiency are important because they simply make way more sense than the alternative. I’m sure I’m leaving so much out from the tour, so by all means, add or correct me after this has posted. 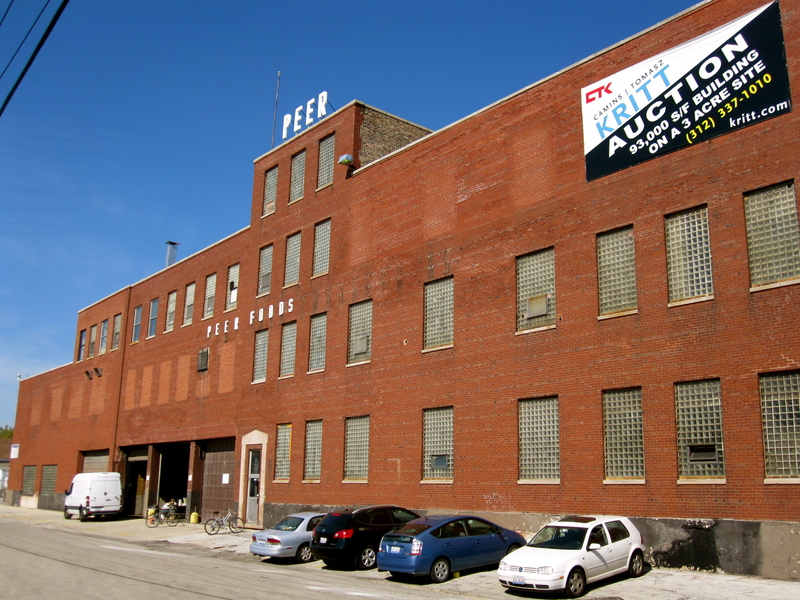 The Plant, located at 1400 W. 46th Street in Chicago at the Stockyards. The 93,000 sf warehouse, now called The Plant, is so unbelievably innovative that I won’t pretend to fully understand everything that I’m going to mention. The Plant describes itself as “a project combining adaptive industrial reuse and aquaponics to create Chicago’s first vertical farm.” While “aquaponics” and “vertical farm” seem innovative enough, there is so much more to this place. The ultimate goal of The Plant is, according to it’s developer, “to create sustainable food and energy systems in urban areas that can be reproduced at a grass roots level by others with few resources,” and that is accomplished through the cooperation of many entities and ideas. This is how I was greeted at 11 a.m., as if I wasn't already happy to be there. They don't do this on SOM tours. The building was sold for the scrap value by the time it was purchased this summer by John Edel, the owner and developer of this project. 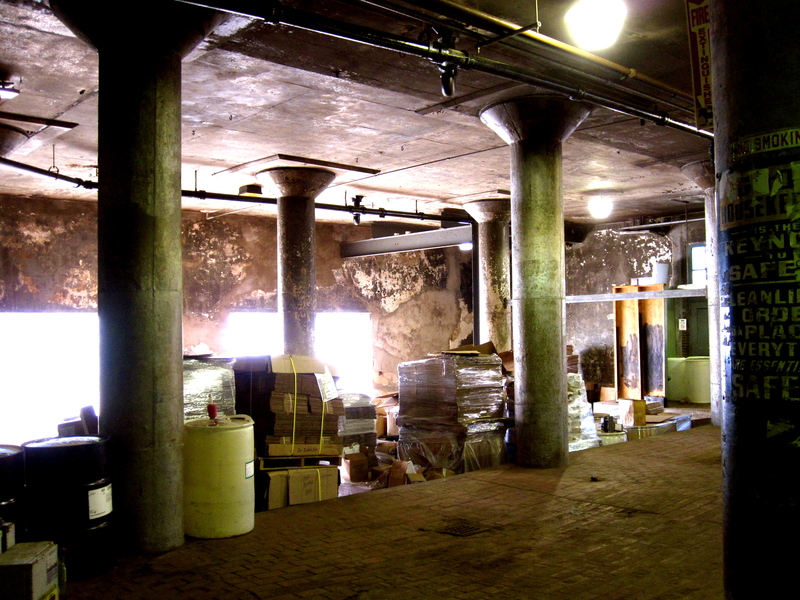 Edel also recently converted a burned-out 24,000 sf warehouse in Bridgeport into the Chicago Sustainable Manufacturing Center, proving his point that “no building is too derelict to be sustainably renovated and made productive again. It doesn’t necessarily require large amounts of money, just creativity.” BOOYAH. His new project could likely be an excellent and unprescedented model for other cities and depressed areas around the country like Detroit, and could finally help keep big box stores out with the work space and food it creates. And yes, it’s a former meat plant, and yes, it still smells meaty (they are cleaning it) and has cage rails on the ceilings that pigs would swing from. And yes, meat plants apparently make for damned good garden spaces, but I’ll explain that later. Mushroom columns hold the weight for organic farming--fitting, no? Note if you can the floor drainage here from the meat packing plant. The floor pavers are durable and dip down to drains in the center of the floor. This drainage would have been astronomically expensive to put in for urban farming. Fortunately, it was already here and in tact! -Community (“shared use”) kitchen, which apparently there is a dire need for. For more on issues with this in the city, please see a Chicago Reader article and extremely sad Chicago Tribune article and video. 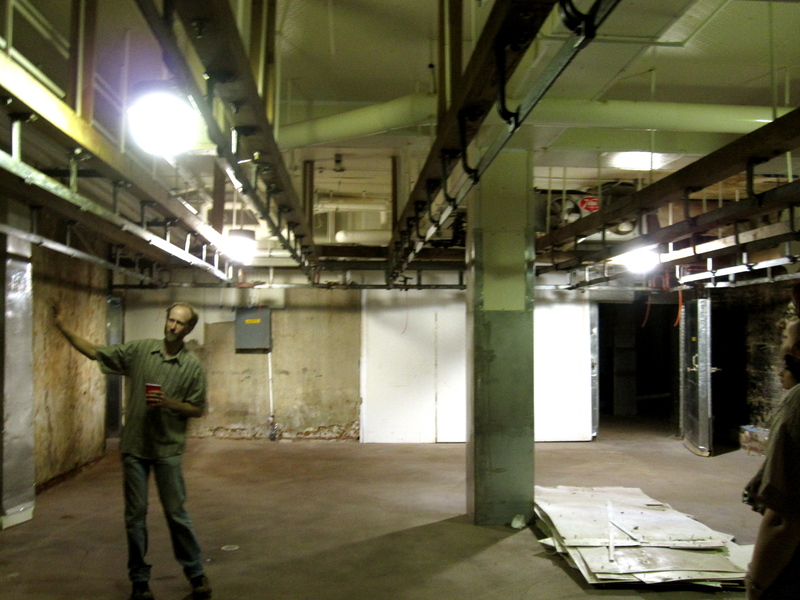 Visionary and developer John Edel explaining the meat cage rails that still exist--and will be preserved--in a future conference room and office space. So all of this is really great, of course, but it gets so much better, folks. 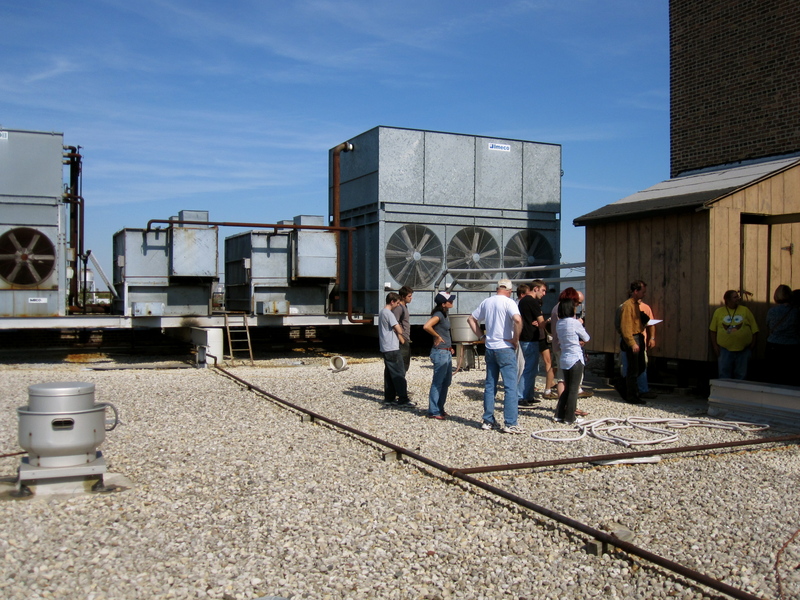 These are all noble ideas, but the expense of heating and cooling a 93,000 sf facility with all of these plants and processes would be insane…well, it would if you weren’t terrifically smart like Edel and friends. 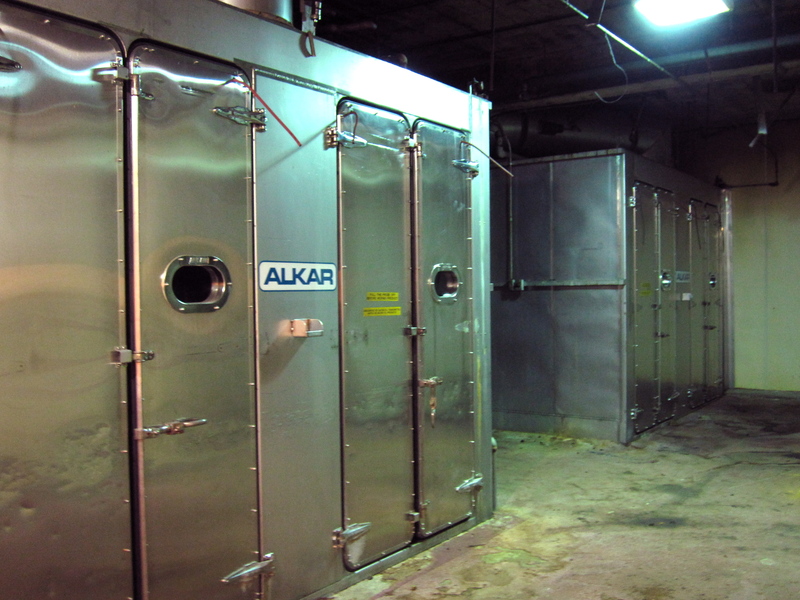 Because this was still used for meat production up until four years ago, lots of coolers and stainless steel remains for these new projects, cutting costs considerably. -Everything in the building is being salvaged, with the exception of some plastic walls that were put in and are unrecyclable. Everything. -Windows are being replaced with triple-pane windows that are produced locally. I know, I hate window replacement, too, but these are mostly just glass block at this point and painted or boarded over. This is bringing in local business and actually will be a huge improvement in this case. 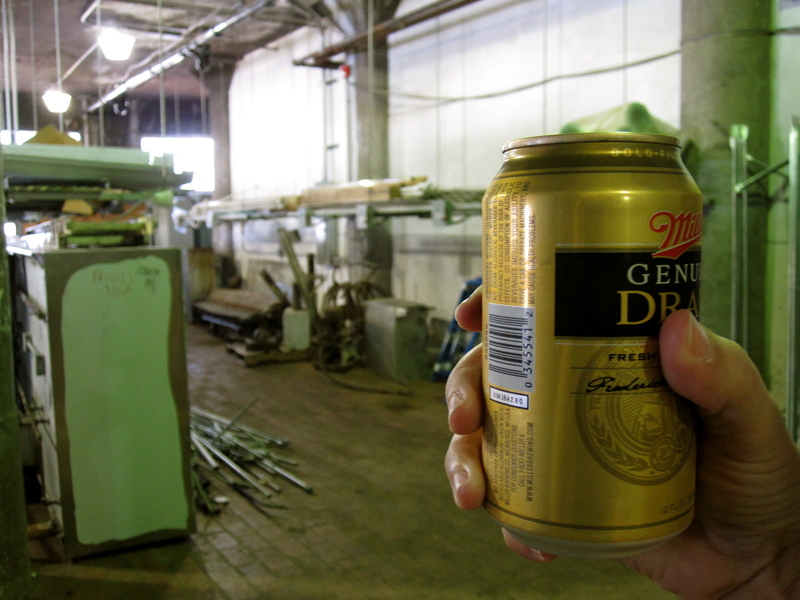 -The building is already extremely well insulated because 70% of it was used as a cooler for the meat. I know, right? -Tens of thousands of dollars in plumbing equipment was left inside the building when John bought it. And this is a building that has some pretty intense plumbing needs. -There will be an anaerobic digester, which will make biogas, which will feed the turbines, which will provide waste heat that will help heat the building. I hope I got that right, and it obviously deserves more attention than this bullet point. -All electricity will be generated on site, so there will be no transmission loses. Vertical garden plans are often thwarted by electricity needs, so that problem is solved. 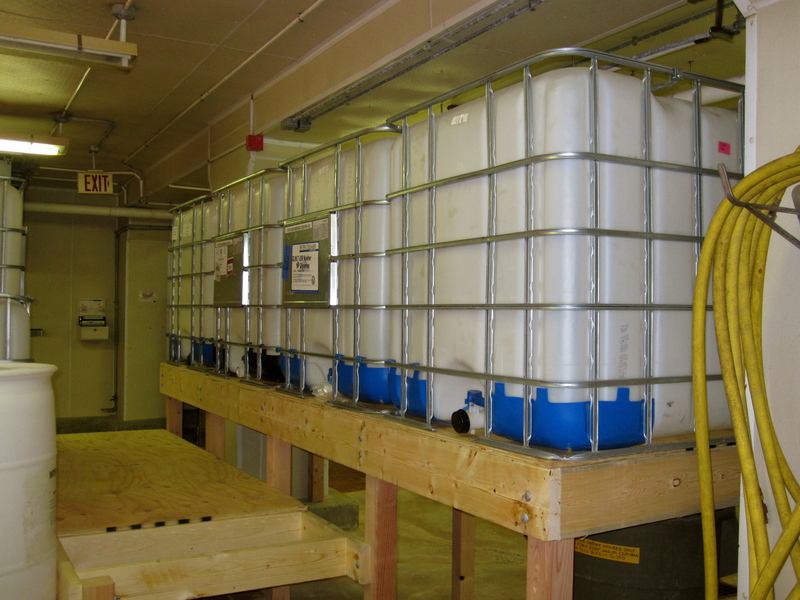 –Fish breading and aquaponics will create fish waste, which is primarily comprised of ammonia, and use it to feed the plants. The plants then filter that same water so that it can return to the fish tanks. Donated containers--I believe from a bakery--will become tanks for thousands of fish. I’m sure I’ve missed a million other ways of closing the energy loop within the building, but the bottom line is that if we want successful, green adaptive reuse projects, we need to find buildings that already have systems built into them that help serve the purposes of the new use(s). Buying a giant warehouse and completely gutting it to the brick shell just isn’t that impressive, green, historic, or cost-effective. Seriously. We all know this intuitively, but as preservationists, we are accustomed to taking what we can get. Being creative with what already exists is so much more effective and rewarding. And involving the community and providing organic produce, work spaces, educational opportunities and more is essential to the success of reuse projects, especially those in areas that have very few places to eat, shop, and work. That’s why we keep seeing the Big Box of Despair going up in depressed areas, knocking out all independent thinking, lowering wages, and destroying the remaining ma and pa businesses that give neighborhoods character. I hate you, Walmart. But I kind of like to think that if humans join forces with plants and fish, we may create a large enough army to beat you, not unlike a Tolkien novel where the good always prevail in the end. The rooftop, which will eventually house 8,000 sf of greenhouse space. Great post, Carla, and sounds like a fascinating project. As you know….I’m a window geek! The glass block really contributes to the building’s character…will the replacement windows be fixed? One lite? Could be quite a change…. Yeah, I think I’m going to have to draw a diagram of the different schools of preservation at this point. There are so many philosophical variations at this point, further complicated by social issues, vacancy issues, economic issues and environmental issues. This project will save a 93,000 sf structure that most certainly would have be demolished–this thing was really on the chopping block. Lots of the interior infrastructure, flooring, etc. are being saved, but no, it’s definitely not a sensitive restoration project. There will be all new windows and some walls opened up to let more light in as well. While I’m also a window geek, this place is super dark inside (I’m guessing because it was essentially a giant meat locker) and wouldn’t be an inviting and rentable space if it continued to be so. That said, if the primary facade were restored and glass block put back into the bricked-in openings, it would look absolutely stunning, no doubt! But alas, this structure will really be an experimental incubator and test lab to bring some life back to the area, so I support the efforts as a more general “save a warehouse that is emblematic of the history of the area, and use it to help preserve the community by breathing new life into it” kind of way. And, of course, I support it for environmental reasons. I guess this is likely a common issue with adaptive reuse projects, but maybe where preservationists need to give more leeway. What do you think? I agree with you in this case, that the overall benefits of reusing this building will outweigh the removal of the windows, especially if this is necessary for its new use. The building itself, while impressive on the inside, is fairly non-descript on the outside (at least from that one photo you provided); the glass block window themselves are nothing spectacular but give the building some needed character. So, I guess it’s a question of preserving that character, but picking your battles. For the scope of this project, sounds like replacing the windows should be low on the list of concerns. I wonder though–are they applying for federal preservation tax credits? They might run into some resistance under the SOI standards for rehab. I think a very cool project is in the works and far more attractive than cage rails on ceilings that pigs would swing from. That’s an image I won’t hold on to. Ha, no doubt! And kind of poetic that a slaughter house room converts so seamlessly to an organic, hydroponic utopia. At least, that’s what I’m anticipating this to place to be–I can get a little “Willy Wonka” when I’m inspired by something. Fyi, John told me that this bldg was never a slaughter house, just the Peer packing plant. Peer was famous for their gourmet hams. Made me feel a little better. Huh, wondering what all the drainage was for then? And thanks for the info. Going to try and help out with some dirty work out there soon! Great article! Thanks for coming out! Next time, if you show up at 10am, I will encourage you to have TWO beers. Well you can bet that once the brewery is up and running, I’ll just pitch a tent outside so I can volunteer every day! Great summation of the earlier article with new info added – great blog, keep up the good and interesting work.